Richard (Ellemford, United Kingdom) on 19 December 2010 in Landscape & Rural. 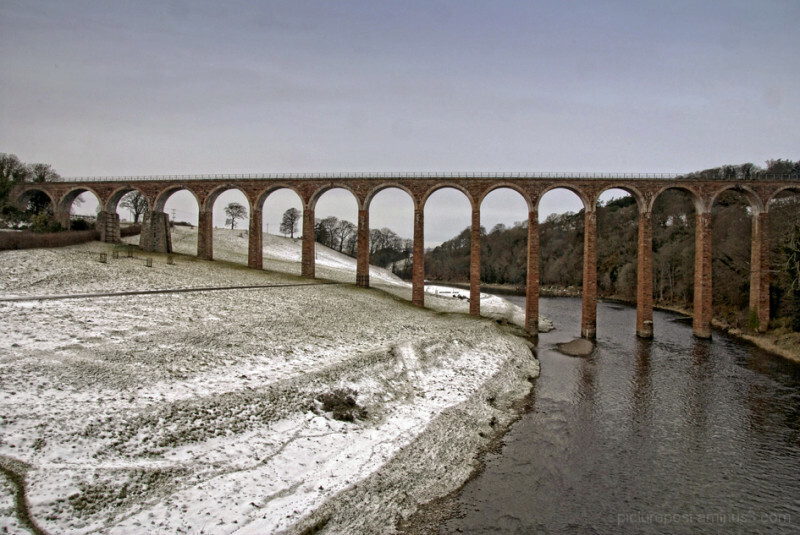 This old railway viaduct crosses over the River Tweed near Melrose in the Scottish Borders. I took it on Friday morning after I'd visited my favourite book shop, Mainstreet Trading in St Boswells. Believe me it was a day for wearing tweed, that famous old cloth which takes its name from the river, which for some of its length is the border between England and scotland, although not where I took this photo. It was minus 5 or so and the wind was biting. While I took this picture I chatted with a man who was about to go fishing. I dare say he thought my standing taking photos in the cold was about as daft as i thought it was for him to go fishing! Outstanding composition. I love these old rail crossings. This ones a winner. This is beautiful. The framing is simply terrific. I also like the tones. This reminds me of a painting. Great colors and composition - nice framing of the trees in the distance! Great shot! I like the framing of the bridge with the hillside and river - looks like a miniature landscape! Lovely shot-and indeed it does look cold. We all think that the other guy is mad for going out in this weather! nicely done Richard...and yes it looks cold! I'm very fond of bridges. This old one is terrfic. yes, a wee bit chilly, I think! great composition! You're both mad for venturing out, you got your catch though, I hope he got his. stunning. Comp and colors are just perfect. excellent composition! nice placement of the river and good vertical positioning of the bridge! i also like the sharpness and detail that you captured - nice work! Excellent capture, just love to photograph these amazing bridges. Great view, like the repeating arches, amazing details. Nice job! Beautiful! We have a similar rail bridge nearby in Eynsford, Kent - you have inspired me to make sure I head that way sometime soon. A wonderfull bridge with a snow, it's a splendid shot. Beautiful. I love the lines, the sharpness of this capture. Excellent capture with a great snow effet!